More than a century and a half after Charles Darwin published his groundbreaking thesis on the development of life, the subject of evolution remains a contentious one for Americans and, in particular, for those who are religious. But when it comes to exploring the views of highly religious groups – white evangelical Protestants and black Protestants – a new survey approach finds their responses vary depending on how the question is asked. One approach in the Pew Research Center survey asked about evolution in a two-question “branched choice format.” First, survey respondents were asked if they believe humans have evolved over time. Those who said humans have evolved then branched to a second question which asked for their views about the processes behind evolution, including the role of God in those processes. 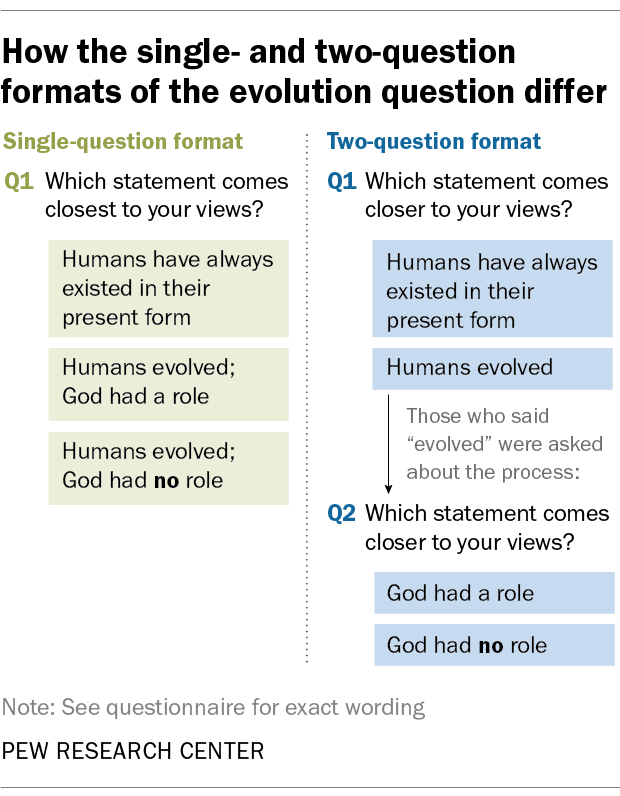 When asked this way, about two-thirds of white evangelical Protestants (66%) took a “creationist” stance, saying that “humans have always existed in their present form since the beginning of time,” consistent with past Center surveys using a branched choice format with somewhat different question wording. But the results differed when the question was posed in single-question format to a random sample of respondents from the same survey. This approach asked about people’s views on whether or not human evolution has occurred, the processes behind evolution and the role of God in those processes together in one question. In this case, a 62% majority of white evangelical Protestants took the position that humans have evolved over time. Similarly, 59% of black Protestants asked about this topic in the two-question format said humans have always existed in their present form. 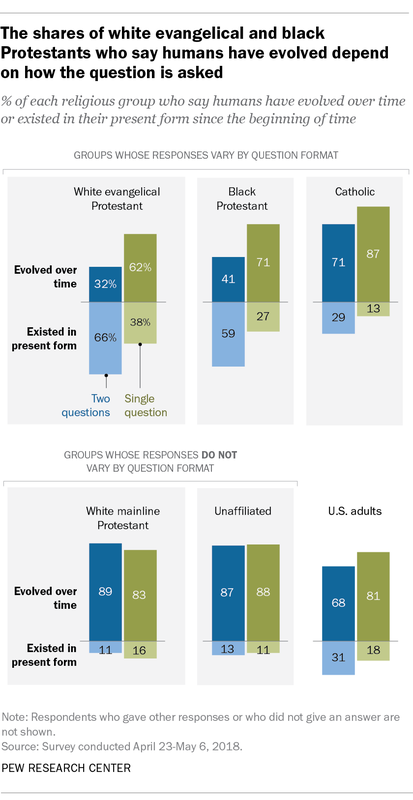 By contrast, with the single-question format, just 27% of black Protestants said this, while a 71% majority said humans have evolved over time. Indeed, groups who respond differently to the two approaches are those who primarily believe that God or a higher power had a role in human evolution. For example, nearly all white evangelical Protestants who say humans have evolved – whether in a branched-choice or single-question format – believe God had a role in human evolution. Differences in response to these two approaches occur among highly religious groups, but not among religiously unaffiliated Americans (those who describe their religion as nothing in particular, agnostic or atheist). Overwhelming majorities of the religiously unaffiliated said humans have evolved over time on both the two-question branched choice (87%) and the single-question format (88%). There are smaller differences among Catholics in response to the two question formats. White mainline Protestants hold roughly the same views about evolution regardless of which approach is used. Regardless of people’s own views about evolution, 76% of Americans see widespread scientific consensus on this issue, saying that “most biological scientists say that humans have evolved over time due to processes such as natural selection.” A 68% majority of white evangelical Protestants and 44% of black Protestants see widespread scientific consensus on evolution, as do even larger shares of religiously unaffiliated Americans (86%) and white mainline Protestants (80%). Note: See topline results here.